, I sometimes go there just to roam the streets, take pictures, eat the traditional food and talk to the locals. It is possibly my favorite city of all that I have visited. I really could have benefitted from some Istanbul travel tips before I went the first time. I learned to do my research. The first time I went to Istanbul I felt an energy as soon as I left the airport. I believe a city is a living, breathing, ever changing organism. Istanbul definitely is that. Istanbul has something about it that draws you in and makes you want to return. I can only describe it as electric. In my many trips there, mostly as a solo female traveler, I’ve learned a lot about the city, its people, and its taxi drivers. 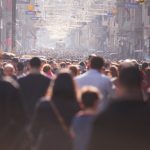 I recommend two areas of Istanbul to stay in, and one to avoid. Sultanahmet is the oldest part of the city and the most visited. It has the highest concentration of tourists, hawkers, and con artists in the city. Keep your wits about you, ladies. The ratio of good looking men increases exponentially as soon as you step off the plane. Many of them gravitate to Sultanahmet. 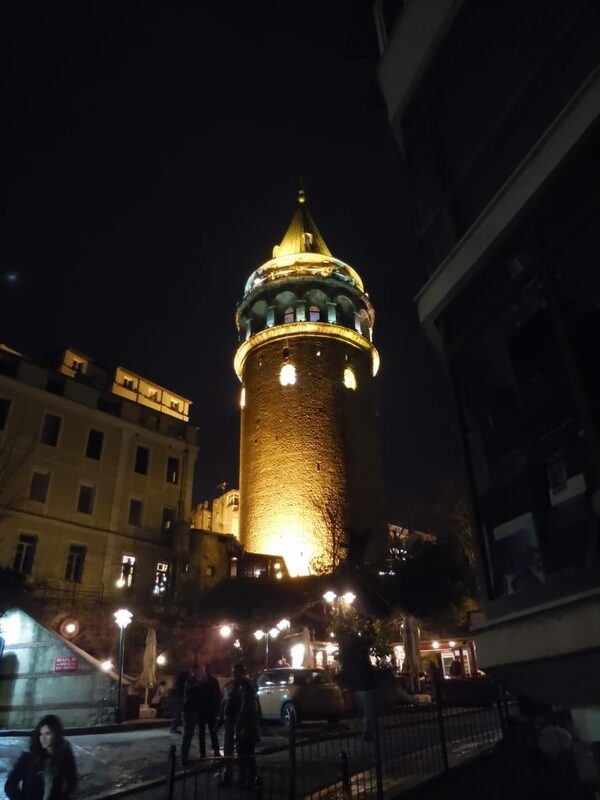 I can recommend a few good places to stay in Istanbul that I have stayed in and loved. I am not paid for any endorsement. These lovely hotels probably don’t even know they are mentioned here. — Zeynep Sultan Hotel is next to Zeynep Sultan Camii (mosque) which is a very small, beautiful, working mosque you should definitely take a peek at while in Istanbul. — airbnb Istanbul I suggest Airbnb for the Galata area because it is the old Jewish quarter of Istanbul. It has many residential options, and boutique hotels as well. In my opinion, the best place to stay in all of Istanbul is a great little apartment in Galata. There are fewer tourists, lots of shops and great cafes, and the shop owners won’t hassle you. You can walk without worrying about getting hassled to buy something or ‘join me for tea.’ Great area for the solo female traveler. 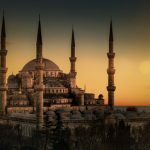 — This Istanbul travel tip is unfortunately a recommendation to avoid an area. Taksim is at the opposite end of Istiklal Caddesi (street) from Galata. 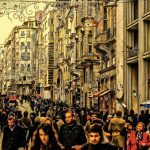 Istiklal is Istanbul’s modern shopping street. It’s great for people watching and finding a cheap kumpir (coom – peer, stuffed baked potato) and shopping for modern stuff you can find in your own home city, so why would you buy it here? — Avoid these overpriced hotels which cater to business travelers or people who don’t know any better. If you’re staying in the high-end historic Pera Hotel, where Agatha Christie stayed, well, then it’s acceptable to stay in Taksim. 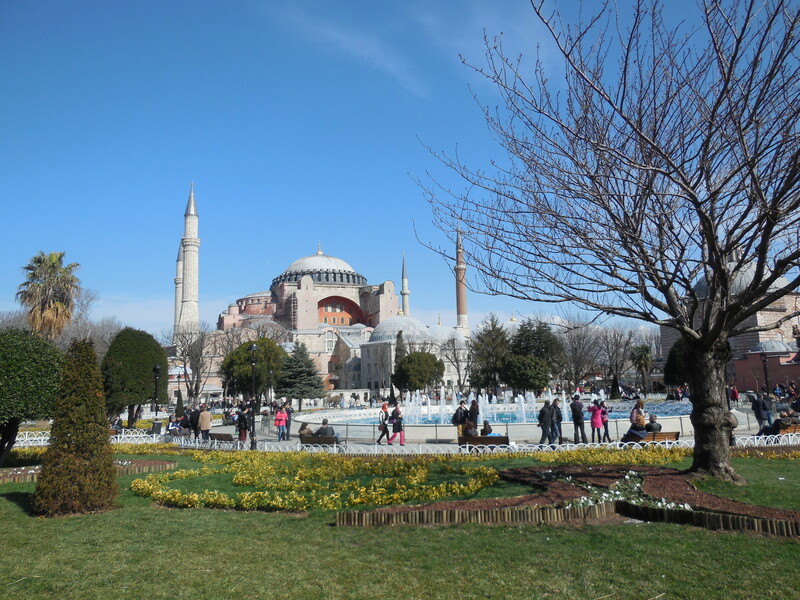 This may seem like an overused and obvious Istanbul travel tip, but that’s for a good reason. The two most visited and most iconic sights in Istanbul will not disappoint. If you visit between mid-April to mid- September, be prepared to wait in line. Aya Sofia was a rather opulent church with stunning frescoes. It was then converted to a mosque when the Ottoman’s came into power. They covered the frescoes rather than destroying them, so many can be see inside. It was converted to a museum by Ataturk in 1935. Across the park is the Blue Mosque which is still a working mosque. Ladies, you’ll need to bring a scarf to cover your hair. Knees and shoulders must also be covered, and gents, no shorts or tank tops. Both sexes are expected to dress modestly in the mosque. 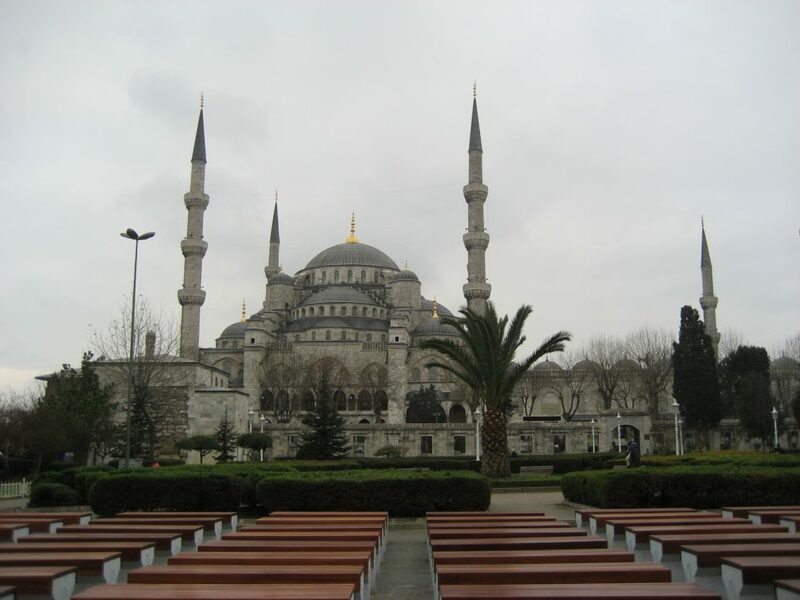 It is called the Blue Mosque because of the blue tiles used to decorate the stunning interior. I suggest going first thing when it opens while other tourists are still at breakfast. Topkapı was the palace of the Ottoman Sultans. It is worth the extra money to see the harem and hire an audio guide or an actual human guide. Official tour guides in Istanbul are required to wear their badges around their necks. They usually wait in front of the monuments rather than trolling the streets. By law they can approach you, but they cannot be overly aggressive or follow you, and the trained, official guides won’t. Dolmabahçe is a short ride away from Sultanahmet on the electric tram. It’s at the last stop, across the Bosphorus, and sits on the coastline. It is slowly sinking into the Bosphorus. Bahçe means ‘garden’ and this is surely a garden palace in all its European splendor. As times changed, the Sultans wanted to compete with the palaces of Europe, so they built Dolmabahçe in the 1800’s. 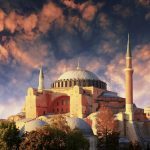 Other popular sights include the Basilica Cistern, Hippodrome, and the Museum of Turkish and Islamic Arts (recently reopened) and Istanbul Archaeological Museum. I recommend you buy the Istanbul Museum Pass for 85TL. It is valid for 5 days. The cost of Topkapı Palace with the harem and all the extras could cost more than 85TL. It is only sold to people who live outside of Turkey. For shopping, or just for amazing photo opportunities, check out the Grand Bazaar, the Spice Bazaar (also known as the Egyptian Bazaar), and Arasta Bazaar. 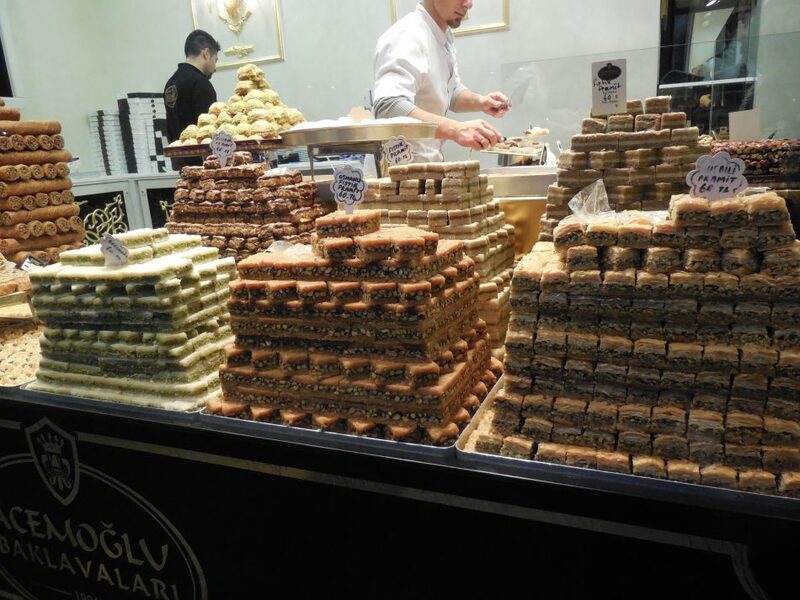 If you love Turkish Delight, I found Arasta Bazaar to be the best and best price, surprisingly. Arasta Bazaar is next to the Blue Mosque. Visit my Canadian friend, Jennifer, at one of her three shops in Arasta called Jennifer’s Hamam. She designs and sells handmade Turkish towels, peştamels, and other beautiful textiles. They are all produced with organic Turkish cotton. She employs weavers from all over Turkey to revive and continue what was a dying art. 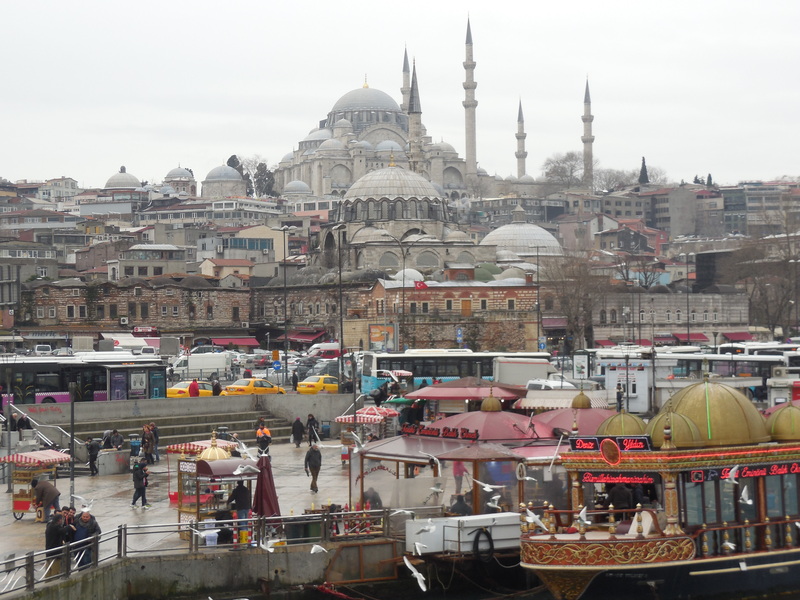 Here are some places I discovered in Galata on my last trip there. 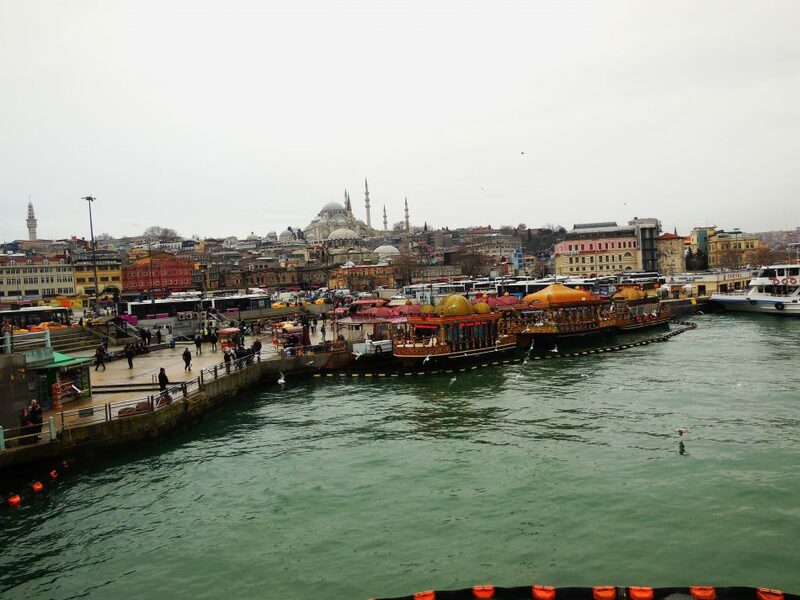 — You must walk across Galata Bridge and watch the fisherman. Some are all business, but others will let you try your luck at fishing and will chat with you. Most Turkish men love to have their picture taken too. — Pera Museum – houses the original Osman Hamdi Bey painting The Tortoise Trainer and so other beautiful exhibits. I saw a temporary exhibit of Frida Kahlo which was amazing, but has moved on now. 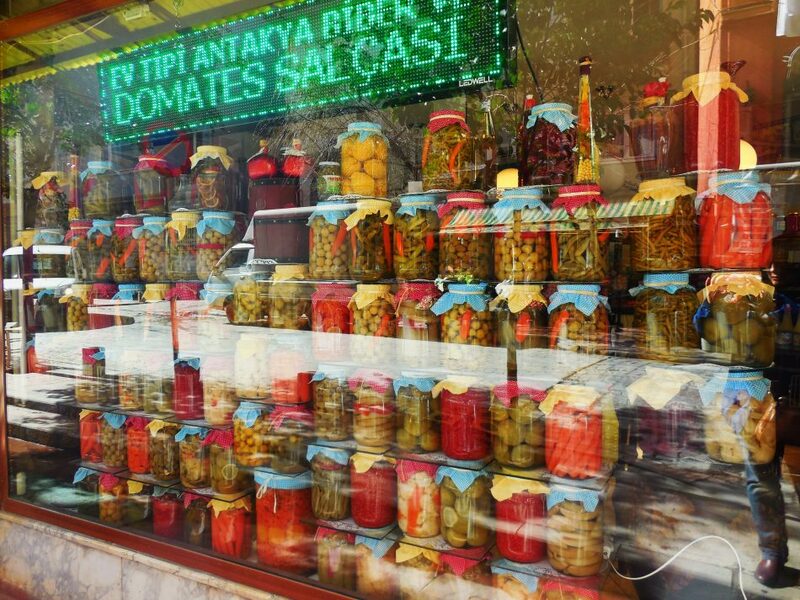 There is a great place to eat in Cihangir, not far from Taksim Square. It’s not a touristy neighborhood, but it’s fun to explore the many up and coming art galleries, shops, artisan food shops, and restaurants and cafes for the hip, modern locals. — Chora (Kariye in Turkish) Church – While it is mentioned in Lonely Planet, it is not often visited by travelers who are not with a group. I’m not sure why not, except the metro doesn’t go quite that far. 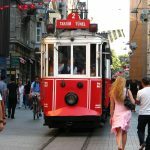 You can take the metro/tram to Topkapı Metro Station, and then get a taxi or just walk. The best way is to get a Golden Horn ferry from Eminönü to Ayvansaray and head up the hill. Not only is Chora Church worth visiting, the surrounding neighborhood is too. You can see Edirnekapı (kapı means gate) which is part of the old walls that used to surround the city. — Rüstem Paşa Camii (Rustem Pasha mosque) near the Spice Bazaar. Ask for directions, or explore the streets till you find it. — Yedikule Fortress and the old city walls – take the metro from Sirkeci (vinegar) Station to Yedikule, head left out of the station and walk parallel to the tracks till you reach the fortress. — One more thing in this section!! Don’t stop reading now! You must visit a hamam, a Turkish bath. There are two in Sultanahmet that are so old and still so authentic. I recommend Cağaloğlu Hamam (jah-low-loo). It is less visited by tourists and stunning inside. Çemberlitaş is also old and stunning, but it’s in all the guide books. You’re not as likely to see an actual Turkish person in there. It’s across from Gate 1 of the Grand Bazaar. Where to begin? There are lots of options, but for me, on foot is the best way to get around once you reach Sultanahmet, Galata, or Taksim and put your luggage away. You never know what you might see, and if you’re a walker like me, you will ignore the narrow sidewalks and traffic-clogged streets and walk and explore. You really can walk anywhere in Sultanahmet, head towards the Spice Bazaar and Eminönü, cross the Galata Bridge saying hello to the fishermen, and explore Galata and Istiklal and even Taksim. Tip: If you see crowds forming or a heavy police presence, especially around Taksim, avoid it. Head away from the crowds. Don’t try to be a part of ‘the local scene’ or get in the middle of a local protest to be part of the action. Walk away. Okay, now that I got that out of the way, I recommend using the electric tram and the metro to navigate the parts of the city that you want to see. You’ll need to buy a token (jeton) each time or if you’re going to be there a while, you can buy a metro card that is refillable and very convenient. You can even cross the Bosphorus to the Asian side underwater on the Marmaray. Not to Galata, mind you. That’s still Europe. I wish I could tell you something about the buses, but I have no clue. I’ve ridden them with a local friend and was dazed and confused the entire time. Istanbul taxis. I have a love/hate relationship with Istanbul taxis. Usually hate wins out and I find another way. Speaking a bit of Turkish will not make you less susceptible to their scams. Some drivers are great, honest, friendly, but I don’t seem to attract those drivers. — Scam 1: The driver will tell you your fare is 30TL, you give him a 50TL bill, the bill disappears from your sight, he shows you a five and says you only gave him a five. No you didn’t. He switched the bills and has your 50TL in his wallet already. Keep your money in your hand if you need change. When he produces the change, take it first, then give him your money. He won’t be happy. Who cares? You’ll never see him again. — Scam 2: “My meter doesn’t work, it will cost you 70TL from Taksim to Sultanahmet”. It actually costs about 10-15TL. His meter works. It is illegal to drive without a working meter. However, he will set it to charge you out the whazoo when you make him use it. Don’t go with this driver. Find another one. Tip: When you book your hotel, if you plan to take a taxi, call the hotel and ask them how much it should cost from the airport to the hotel. If the driver tries to scam you, tell him you have been there before and know it only costs — lyra and he better run his meter and if he doesn’t agree, well, you know, find another driver. — Scam 3: “I can’t drop you at the door of your hotel. That’s a no traffic zone, but I can get you close to it.” A no traffic zone? In Istanbul? Never seen it. Cars go everywhere, even where they shouldn’t. If he won’t agree to take you to the door? Yep, you guessed it. Find another driver. It also helps upon departure if you want to take a taxi to the airport or to Taksim to the havaşta meeting point, have the hotel call and arrange one for you. Then they know you already know how much it should cost. Many companies provide an airport pickup service in a minivan (dolmuş). They run at scheduled times, but are cheap, convenient, reliable, and the hotel will organize it for you. They will come right to the hotel door. Haha. Havaşta is a company name I believe, but it is a chartered bus that runs from Taksim to Sabiha Gökçen Airport for 12TL last time I took it. Cheap, reliable, on a schedule, comfortable, but too big to come right to your hotel door. This post is going to need its own zip code soon. I’ll post more tips about how to keep your money safe, how to keep the hawkers at bay, and how to say no to marriage proposals in another post. Stay tuned. Excellent article, Mary. Fantastic photos too. We were there for 30-days in 2015. 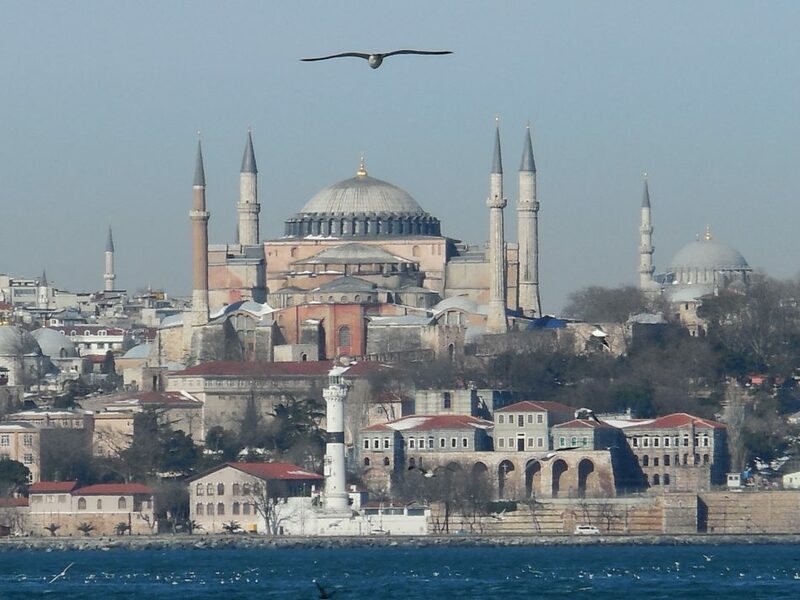 We love Istanbul – its culture and cuisine. We would love to return as soon as the U.S. State Department removes travel to Turkey from its travel warning list. Thanks, Michael! I love Istanbul as well. I think I’ve been there six times. I have lived in Kuwait for 8 years and it is only a 3 hour flight away, so I used to go quite often. I feel saddened by what is happening there.